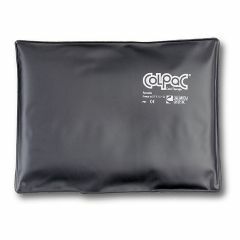 Customers buy these products with the ColPaC - 7.5 x 11"
AllegroMedical.com presents The Black Polyurethane ColPaC. This flexible resusable cold pack easily sizes and shapes to fit any body area for comfort and ease of use. Simply chill in freezer and apply. For Initial Chilling of the ColPac, remove from all packaging, place flat in Chilling Unit / Freezer for two hours. Do not chill below 0° F. To keep them moist, place in a plastic bag, seal, and then place in freezer. This will preserve them and prevent them from drying out or getting hard. Never Let ColPacs Dry After Use - Always Keep Them In Freezer. Sturdy. Effective. Easy To Use. Heavy. but so are the profession. Quality Oriented. Elderly. knee surgery. Bum knee. Arthritis. But had some surgeries. awsome relief!!!!. Too many back problems. buying time before knee replacement. Also helps with the swelling with arthritis or any other crazy thing I get myself into. Too many soccer matches. Athletic. Elderly. Safe. NOT TOO EFFECTIVE. Lightweight. FOR PAIN RELIEF. A PERSON LOOKING FOR COLD. DON'T USE THIS PRODUCT IF YOU ARE WANTING REAL RELIEF FROM PAIN. THE COLD IS NOT AS INTENSE AND DOES NOT LAST LONG ENOUGH TO PROVIDE PAIN RELIEF. THE PRICE IS EXORBITANT. USE A BAG OF FROZEN PEAS!!! Sturdy. Easy Storage. Easy To Use. Average Health. Athletic. Overused shoulder. knee surgery. the right size and it appears that it should last awhile. is the black ice pack good for use after knee surgery ? or is it to heavy? What is the difference between blue vinyl and black polyurethane covers for compact? I use these ice packs almost daily and have worked with both colors. I find the black covers to be more durable than the blue. Having had many of both, the blue cover seems to crack over time whereas the black ones do not. To the point that I only buy black now even if it costs a little more. I would guess it weighs about 2 lbs, maybe 2 lbs and a few ounces. My last answer was for the standard 10x13. The area of the oversize is 71.3% larger so roughly 4.8lbs.